An Annual Conference with the theme : Ushering 2030 : Envisioning Responsive Schools was organized by Forum Of Public Schools on 30th April 2016 at the India Islamic Centre, New Delhi with Smt. Sumitra Mahajan Hon’ble Speaker Lok Sabha as the Chief Guest of the confluence. Philosophy and doctrines of enlightenment with educationalists as torch bearers of progress has been the vision of Forum Of Public Schools since its establishment in 1985. Empowerment of education among school going children with creative and skill based learning is the main aim of all academic policies and programmes. School Principals and teaching faculty need to take proactive steps to prepare the students for facing the global challenges. The forum has been time and again providing avenues for the professional development of educators by organizing enhancement programmes, conferences, seminars, community service programmes, inter school cultural exchanges and career breakthroughs. Emphasizing on creativity, collaboration and innovation, the forum’smission is to promote excellence in school education by setting high professional standards and positive development amongst its member schools. The role of school leaders is to steer their institution to new zeniths withrecognition of education as a national prioritytherefore the forum has been providing a pedestal for discussions and networking amongst its member schools. The conference commenced with lighting of the lamp , followed by the Annual Report presented by Ms. MuktaMishra, Secretary, FPS. Mr. Sanjay Bhartia, Chairperson FPS welcomed the Chief Guest , Honourable Speaker of Lok Sabha, Mrs. Sumitra Mahajan. Mrs. Mahajan is the senior most among women members of parliament in the 16thLok Sabha and has been holding a number of portfolios at the state and parliamentary level. She addressed the august gathering with her words of wisdom, thoughtfulness and vision of sustainable development and laid stress on peace, health and progress. She emphasized on use of literacy in true sense with accessibility, quality, equity and affordability. The essence of her address was not to create robots out of today’s students who are aiming at higher marks and CGPA’s but to handle them with sensitivity, compassion and humane touch so as to mould them into better human beings. She released the Newsletter of Forum of Public Schools and presented the mementoes to the various inspirational Principals, motivators and leading educationists. Mr. Rohit Bajaj, Treasurer FPS introduced the Guest of Honour Dr. Pankaj Chandra, former Director IIM , Bangalore. Dr. Chandra who has taught at various universities across the world,talked aboutthe future of education through sustainable development and emphasized on search and research in the process of imagination. The Concluding remarks of the inaugural session were presented by Dr. S.L. Jain, Patron, FPSwho echoed the sentiments voiced by the esteemed speakers. Ms. Archana Narain Jt. Secretary FPS, thankedthe Chief Guest Hon’ble Speaker Smt. Sumitra Mahajan, the guest of honour Dr. Pankaj Chandra, Former Director, IIM Bangalore., and members of teaching faculty present in the auditorium. 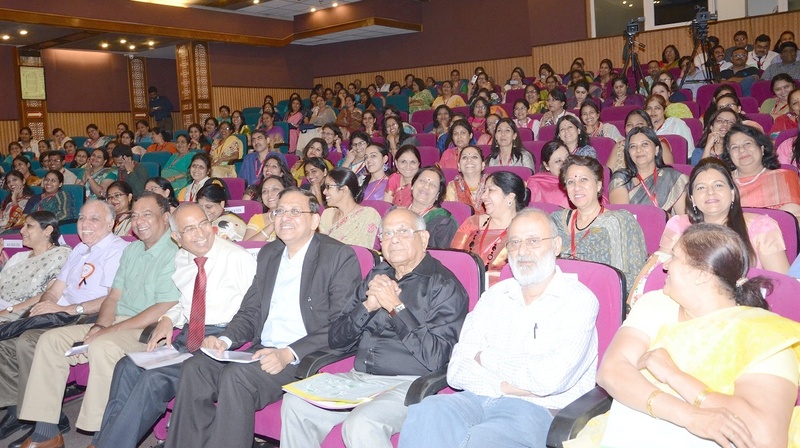 The conference attended by a confluence of principals, highly passionate and enthusiastic teachers of leading schools of Delhi further engaged themselves in various sessions focusing on four major areas of school education : Skills, Innovation, Technology and Values. The next session saw presentationon skill based education by Mr. Deepak Amitabh, CMD , Power Trading Corporation, followed by a discussion on “Innovation in School Education” by panelists Dr. Sachin Sethi, Director J.K.I.M.T , Mr. Gauhar Raza, Principal Scientist , CSIR and Dr. Namita Ranganthan, Prof. CIE, Delhi University. Post lunch Ms. AvnitaBir director, Principal R N Podar School, Mumbai conducted a workshop on flipped classroom based on Education and Technology . Later Sister Urmil versatile scholar and spiritualist from Brahma Kumaris stressed on value based education in schools and importance of pure vegetarian food. The event concluded with vote of thanks by Ms. Anupama Bhardwaj, Vice Chairperson, FPS with the note that education, technology and values go hand in hand for promotion of excellence in school education and preparing responsive scholars of tomorrow.